Ghana striker Jordan Ayew insists helping Sochaux avoid relegation is his only concern at the moment and not June's World Cup in Brazil. 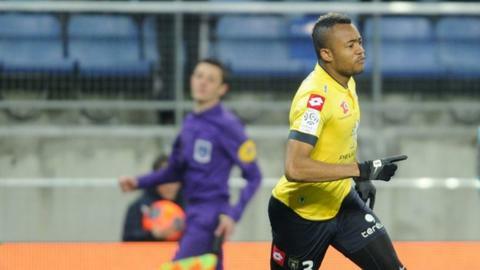 Ayew played a significant role as Sochaux won 1-0 at Reims on Sunday. Despite the three points the club are still in 18th place in the French top-flight standings, two points from safety with only four games to go. "We have a big task of staying in the top league and that is very important," the 22-year old told BBC Sport. "I think yes we can [stay up]. With four games left we have to do our maximum to stay in the first division. "Yes, I am looking forward to the World Cup, but the most important thing is to finish well with Sochaux. "Some people had written us off in January, but we are now showing strong desire to stay in this league. I know we can." Ayew has scored three goals for Sochaux since he joined from Marseille on loan in January and knows playing well for his club can only help his chances of getting into the Black Stars' squad for Brazil. "I know if I do well with my club then I don't have any problem to be in the national team because my performance will make a strong case for me," he said. The four-time African champions have their work cut out in Brazil where they will face Germany, Portugal and USA in Group G.
"It's a tough and exciting group. The most important is to go there and represent Ghana to the best of ways," he added. "We have to try and do something remarkable, importantly to play the football we know how to play and to do what we did in 2010." Jordan Ayew is the son of Ghana great Abedi Pele and has so far won 11 caps and scored two goals for the Black Stars.